Growing up all of our dogs were allowed on the furniture, so the sight of a big dog lounging on the couch was perfectly normal. But when I finally moved out on my own I started to realize how much wear and tear my sofa was taking from my own dog Laika. It was one of those “hey I paid for that!” moments of adulthood, and I suddenly realized why many people have the no pets on furniture rule to begin with. Instead of not allowing my dog up on the couch I found some ways to help protect my furniture from her claws and all that fur. I also had to teach her to stop trying to bury her toys in the couch cushions, but that’s a story for another time. I don’t mind her being up on the furniture, but I needed to find a way to keep it protected. Do you allow your dog on the furniture? 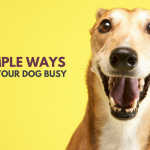 Do you find yourself constantly picking up dog hair and trying to keep things neat and tidy? For certain breeds it’s a never ending task; I sympathize with those of you Husky owners, I really do. And remember that accidents happen, so keep a bottle of Nature’s Miracle on hand, this stuff is a life saver for any pet owner. Do you have a bunch of dog hair, drool, odors, and scratch marks on your furniture? 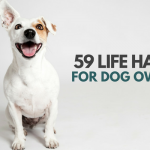 Are you looking for some simple ways to dog proof your couch? I was tired of cleaning my couch and chairs every other day so I bought myself a few throw blankets – and I’m happy to say keeping my furniture in decent shape has been much easier since. The best tip of all, and probably the most low effort, is to keep your furniture protected from your dog by keeping it covered. The sound of that might bring memories of plastic covers like grandma used to do, but there are a lot of modern options. You can cover your furniture with washable blankets, slipcovers, or throws. 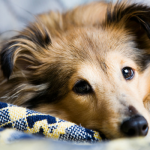 Your dog has probably has a favorite spot to lay, and often times that’s right on the couch. Make sure that spot on the couch is nicely covered with something that’s easy to maintain and wash. I use a lot of blankets and throws in my home. It’s much easier to just toss a blanket in the wash than it is to vacuum your couch every other day. If you like more of the polished look you can buy some slipcovers. They come in virtually every color & pattern imaginable. If your crafty you can even make some covers of your own in the fabric of your own choosing. Want to protect your couch from your pets? Keep it covered up with a blanket or throw; it doesn’t much any easier than that. Avoid the frustration of coming home to chewed up chair legs by avoiding wood furniture. Not all dogs chew on furniture, but for some young pups wood can be irresistible. Teaching a dog not to chew is easier said than done, especially if they’re doing it while you’re away. If you do have wood furniture that you want to keep your dogs mouth off of there are products on the market made to repel your dog from chewing, such as bitter apple spray. You spray it on your table legs and it will keep your dog from gnawing them. If your dog is especially destructive while you’re away I’d recommend crate training until you can get a better handle on the situation. Not only does chewing on wood destroy your furniture, but it’s also hazardous to your dog. 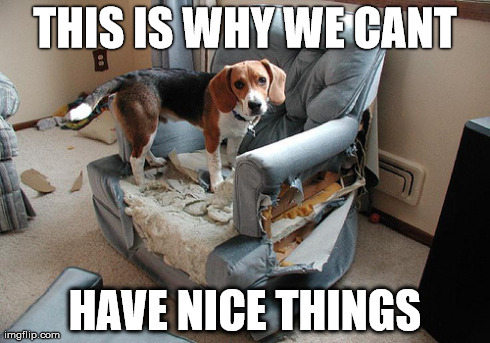 If your dog has already chewed on your furniture some wood can be repaired if the chew marks aren’t too severe. The two most popular choices for pet proof furniture materials are leather and microfiber. Leather is a popular choice because it’s easy to clean, and microfiber is popular due to it’s durability. If you’re not in the market for new furniture just remember my first tip — anything can be covered with some nice slip covers. Leather (or pleather) furniture is nice for pets because it’s nice and easy to clean with a simple wipe down, and it doesn’t attract hair like fabrics. It’s also more odor resistant than other materials. And although leather is a popular choice keep in mind that it can be scratched. If you allow your dog on the leather furniture make sure their nails are nice and trimmed. If you do end up with pet scratches you can can repair them on your own with products made for leather. Microfiber furniture is a great choice for pet friendly homes due to it’s durability. Compared to most woven materials, microfiber is difficult to stain and is designed to repel wetting, though pet hair still tends to cling to it. Microfiber is relatively easy to clean with a damp cloth and it doesn’t seem to hold odors as much as other fabrics. Many cat owners say they choose microfiber because their cats aren’t interested in scratching it. I wonder if it’s because it doesn’t make that satisfying ripping noise they seem to relish so much. Nothing decreases excess shedding quite like regular grooming. Bathing and brushing your dog on a regular schedule will help cut down on all that extra fur all over the place. If you have a dog that sheds a lot get yourself a de-shedding tool like the Furminator, and vacuum regularly to cut down on stray hairs. Regular nail trimmings will help decrease the chances of your furniture getting scratched. If you find your dogs short nails are still awfully sharp you can also file the tips to be smoother. To keep Laika’s nails smooth I bought a steel nail file after getting tired of buying those cheap ones that only last a month. And I know – no matter how much you groom your dog they’re still going to shed. If you’re dealing with extra shedding I’m sorry, but to help there are some simple DIY hacks for cleaning up pet hair. No matter how much you clean and vacuum you’re going to end up with loose pet hairs. If you don’t want them to stand out as much buy a blanket that matches your pets hair color. Luckily I don’t have to do this with Laika; but if I had a white dog and black furniture I think I’d definitely consider it. If you’ve got a mud room utilize it when taking your dog in and out of the house. If you don’t have a dedicated room for your entry set up a little space and keep some extra towels on hand. Remember to wipe off your dogs muddy paws before letting them enter the rest of your home. In a perfect world we’d all have a super fancy mud room made just for dogs. My mud room is nothing like that. My little area for cleaning up my dogs after coming inside is just a washable rug on the floor, some towels on a rack, and a place to hang leashes – nothing quite so spectacular. But making sure I always use that same entry means I always have some towels on hand to clean up Laika’s muddy feet. If you find a nice comfy bed for your dog it can replace his favorite spot on the couch. I opted for a nice padded, orthopedic bed for Laika and she loves it. If I’m not on the couch and she’s resting I know where to find her – sprawled out on that doggie bed. There are a lot of different options when it comes to dog beds. You’ve got bolstered, orthopedic, heated, and pillow beds to name a few. 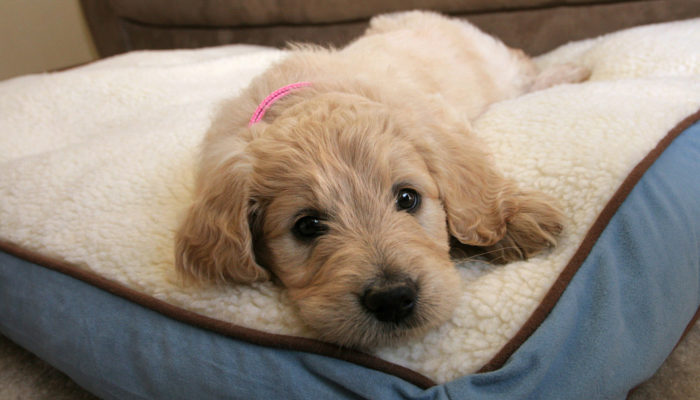 Hartz put together a nice quick list of things to consider when choosing a bed for your dog that can help get you started when looking. Not all dogs will love their new beds right away. Laika wasn’t too fond of using her bed until we placed it right next to the couch. If your dog likes to be a part of what’s going at all times (aka velcro dog syndrome) consider placing his bed somewhere that will let him keep an eye on things. 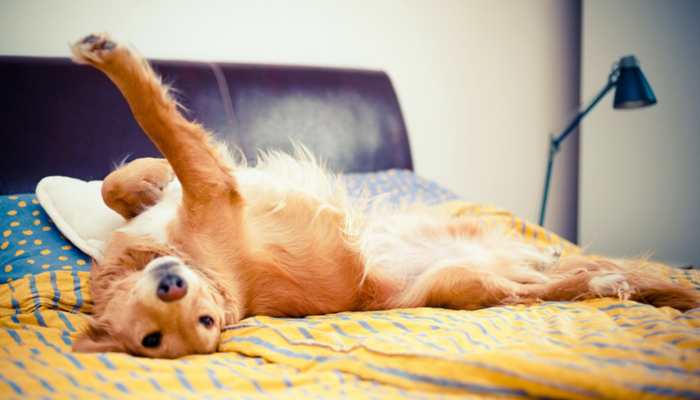 If your dog doesn’t naturally take to his bed there are some easy steps to take to get him comfortable with it. The more time your dog spends in his bed the less fur, scratches, stains, odors, and puke you’ll find on your furniture. Want to help keep your furniture in decent shape? Invest in a nice, comfy bed for your dog. 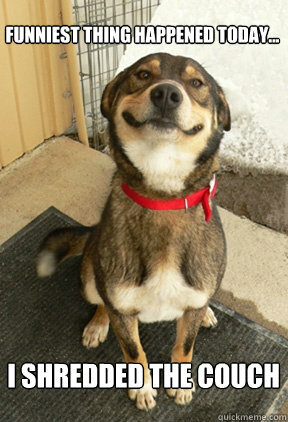 If you’re not a fan of having your dog in certain rooms of the house just remember to keep those doors shut. One of my favorite tips for keeping your furniture clean with pets is having a couch with removable seats. If you’re looking for a new sofa and want something pet friendly get a sofa that has removable seats. Those individual cushions can be unzipped for washing, which makes removing pet odors & stains much easier. No matter how much you groom your dog there’s going to be some shedding. And if you’re anything like me you find dog hair in your cupboards, on top of the TV, and all over the drapes. It’s almost as if dogs have the whole drive by shedding thing down to a science. If you’re looking for an easy way to help clean up some of that loose fur use a lint roller on your furniture. Don’t have any lint rollers? One of my favorite hacks is to use a roll of packing tape; it works just as well as lint rollers. How Do You Dog Proof Your Furniture? How do you keep your furniture in one piece? Do you have a bunch of bite marks on your wooden furniture? What materials have you found to be pet proof? Any tips I missed for dog proofing your furniture? I’d love to hear your thoughts – leave your tips and stories in the comments below. This post contains affiliate links, for more information please see our disclosure page. Great tips! I don’t allow my dogs on the furniture unless I specifically invite them onto it, which is rarely. That’s my way of keeping it clean, however using covers & frequent grooming are the best ways to keep it clean I think. To prevent chewing, shredding, keep the dogs busy w/ chew toys and use bitter spray to prevent chewing! Bitter spray can be a life saver. I’ve heard so many great things about bitter spray – I really lucked out with Laika. She has a lot of bad habits but chewing on furniture isn’t one of them.. Our Lab growing up however, he was a different story. I love using covers – and it gives us the chance to easily “decorate” with a new blanket every now and then. Love this post! Haley was always allowed up on our old family room furniture, but we just bought new furniture a few months ago. I almost banned her from it, but didn’t have the heart to do that. I just bought a yard of fleece fabric that matches the new brown microfiber furniture and sewed a rectangular cover slightly larger than the size of one cushion so it could be tucked in neatly. You can barely tell it’s there and it stays tucked in perfectly. If you don’t sew, you could just cut it neatly and it probably wouldn’t fray around the edges, but I wanted to double layer the fabric to make it thicker. Then I just throw it in the washing machine once a week, looks great! I like that it’s not super huge and can be washed with other items, but it does just cover one cushion. We also trained Haley to ask permission before jumping up on the furniture which helps if the cover is being washed or we have guests over and don’t want her on the furniture. Lots of great tips in your article! It’s so hard to ban them from the furniture isn’t it? That’s awesome that you made a custom cover, I really need to stop being so lazy and just throwing blankets over everything. I have the sewing equipment – there really isn’t any excuse. I love your tip about asking permission before jumping up – that’s a great one. Great tips. I pet proof my furniture by not allowing my pets on it! 🙂 And yes, that includes the cats too. People are surprised our cats are not allowed to put one paw on our couch. They are not allowed on any chairs either. However, I do allow my cats on my bed. The reason for this is simple. Like you said, I don’t want my couch or chairs damaged. Our bed has taken some abuse, but I guess I just put up with it. Our cats were allowed on our old couch, and they destroyed it. I thought it would be challenging to train them not to sit on our new couch, but it was actually easy. I just had to be consistent and not allow them up, ever. If they put one paw on the couch, I just told them “no” and if they didn’t listen, I squirted them with water. They learned in about one day not to go on the couch. I also bought them a new cat tower to sit on and scratch to their little hearts’ content. And we have plenty of dog beds for all the pets to lounge on. Great post, Jen! I used to allow my golden retriever Savanna on my sofa and on my bed. I had a leather sofa so it was easy to wipe clean. I kept an extra sheet over the top of the comforter on my bed to keep my comforter clean. However, as Savanna has gotten older she can’t really get up on my bed anymore. Now Savanna sleeps on her orthopedic bed and she seems quite happy with that. My friend’s family used to keep a chair covered with a blanket and the Husky always sat on it. When company came, they would take the blanket off. Inevitably, the guest would sit there and then the Husky would stare at the guest all night, probably wondering why they were sitting in his chair. We use covers and blankets and because Cookie has some issues with the odd leaks, we put pee pads underneath the blankets. These are some great tips! Mauja and Atka don’t hop on the couch too often (I wish they would more! ), but we’re always covered in fur so it ends up on the couch regardless. Blankets are a favorite as well as regularly vacuuming the couches. I utilize most of these! I have microfiber sofas and buy the hair removal tools to brush them up every few days. I did not allow my previous dogs on the furniture – they were both double-coated and the hair was just too much. Ruby and Boca have short hair but they still shed a lot. Now I can’t imagine curling up on the sofa without my two ginger bookends. You’re right – it does take some household rearranging when you have pets. I’ve never had microfiber furniture with my cats, but they love microfiber blankets! I think it just doesn’t lend it’s self to scratching because it is so soft. When cats scratch something they are either using the object to help them stretch, leaving their scent on the object, or sharpening their nails. Those are some great tips for sure! Simba is pretty good with the furniture and whatnot. The only thing he messed up was his OWN dog bed pillow LOL I think he likes human stuff too much to mess it up SMH. Cute article! These are all great tips. My husband is against our dogs being on the furniture but we do now allow them to sleep with us in our bed once or twice a week. Was the invest in a nice dog bed supposed to be so that your dog doesn’t take over your furniture? That doesn’t really work in this house. They have a bunch of dog beds but still choose to sleep on the chair or couch and my bed instead. 100% yes to slip covers for anything that is not leather or pleather. Oh my goodness my first couch was a horrible mess only a year and a half after Davinia joined us just from the dirt she would bring into the apartment and things she would bring on the couch with her. Never get white couches not completely her fault they were not perfect when she arrived but she didn’t help the situation one bit. These are great tips! I happen to have leather couches after our last set was always covered with long hairs from the Tzus. Sooo much better now, they are very durable with the dogs, unfortunately the cat may be missing some nails soon (just kidding), lesson learned, Leather is not good with cats but great with dogs! There are nail covers that slip over cat claws to protect furniture. Check with your vet. Great ideas. But I have to say I LOL’d a couple of times. As I sit here at the table, our german shepherd mix is stretched out on the couch-the uncovered couch. We conceded our home to our pets a long time ago. One caution about chewing wood-my sister’s dog actually choked to death on a wood splinter he chewed off her bed while she was at work. He’d never chewed the bed before so she didn’t close her bedroom door that day. Some excellent tips that are important for a new dog owner! My number #1 tip is hide everything. If the thought occurs to you that your dog might chew it, they probably will. Maybe not today, but they will… Or maybe that is just Luna. The color coordinating with your dog can be pretty awesome. It really doesn’t pay for me to have black furniture. With our four pups, our couch gets a lot of wear, we have a heavy duty cover on it that is so big I have to take it to the laundromat to wash them. Thankfully we don’t have any chewers… any more, and despite the numerous amount of dog beds the dogs still choose the couch over them. With our dogs it wouldn’t matter what color our furniture was, it was still show fur, and thank goodness for hardwood and tile floors easier to clean in mud season! And you are right, grooming is a MUST especially when they blow coat (like now)! These are excellent tips! The boys are allowed on the furniture but having a some rules and good dog bed can certainly help to extend the life. Now the cats….thats another story! We just bought new living room furniture and opted to go with leather, specifically for the dogs, lol. We’ve only had the set for a few weeks, but so far it’s been one of the best decisions we’ve ever made. It is so ridiculously easy to clean. I also buy the cheap $5 fleece blankets at Target or Walmart and keep those covering all of the furniture. They’re cheap, thin yet protective and easy to throw into the wash.
Great ideas! We totally let our dogs on the couch you do have to make allowances and, next time, make wiser choices about the fabric. Thanks for suggesting microfiber. I’ll definitely look into that! Awesome tips!! We have two dogs so these are handy tips. If you are going to be away from your house for quite a few hours, you may want to invest in some covers or sheets to cover your furniture. What can we do to stop chewing on the corners of our cedar chest and other places? They are 6 mth old brother and sister beagle puppies. A hand full. Nothing is safe! I’ve heard a lot of good things about Bitter Spray and it claims to be safe on wooden surfaces, though I haven’t personally used it. Unfortunately since they’re young & teething and chewing on things when you’re not around or able to watch the only way to really prevent prevent it is to block their access to it. I used baby gates to keep my dog confined to certain areas when I wasn’t around. 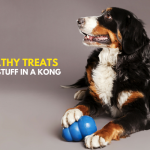 All great ideas for a relatively well behaved dog. With my pug coordinating colors, using blankets, and leather/pleather materials were fantastic solutions. Also grooming regularly was a bit helpful. However, these points seem to be more oriented towards pets that shed and do minor damage with their nails. Once I got a puppy (a very active Boston terrier) I realized it’s an entirely different situation. There was no solution but blocking access to anything I wished not to be chewed and torn to shreds. Training a puppy will work over time, but not in the first year in many cases. No matter what the material, how many covers or blankets, or how saturated in bitter apple spray, I’d return home to a pile of stuffing that was once an armchair or sofa. The same destruction occurred of unexpected items too, even my home’s baseboards. I cannot stress enough that training can work long term, but limited access is the only choice for some puppies initially. Unfortunately, I learned this the hard way with many damaged household items. Every dog is different though. My pug, for example, was a breeze in comparison. I adopted my Jack Russell mix who was just under a year old at the time. She was/is a chewer, but not furniture, thankfully. Just her bed and any blankets. It’s now six months later, And she has since improved with age. I replaced two dog beds in short order and didn’t want that expense. My saving grace was making a cover out of a canvas painters drop cloth. I found this hint and had to try it. I haven’t replace her bed at all and she does not care to chew it. She tried at first, but it doesn’t rip and tear, so she quit. I just pop it all into the washing machine when it’s time to wash it and then dry it in the dryer. The microfiber cloths seem to help also. They give her something to thrash around and play with, but does not have the rip and tear like the terry cloth towels. I haven’t tried canvas painters drop cloth; that’s an excellent tip. And, I will also add, that having a kennel to put your dog/puppy into is essential. My dog is not allowed to roam unless I am there to oversee, and even then I have many doors closed. When she misbehaves and is not listening well (just for a short time, like a kid in time out), when I leave the house or even work out in the yard for a bit, and at night, she is in her kennel. I always reward her with a treat to get her in there (not when she misbehaves). And, once I got her bed covered in a canvas dropcloth enclosure I made, I had no worries she would destroy her bed. I couldn’t agree more. Before I started using a crate I was worried sick about what my young dog was getting into during the day, and whether or not she’d start chewing up something that could make her sick. My main problem with my dog is that he is peeing on the table legs in the kitchen while I am at work. He is confined to the kitchen as it has a Lino floor and easy to clean. He is getting on and I was looking for something to put on the table legs to deter him from peeing on them. Neither of my dogs damage any furniture but the peeing on the table legs is really getting to me. Thanks for pointing out that our pets have areas that they love, so we must cover it up if it is on the sofa or a piece of furniture to keep them from damaging it. I will follow your advice since I will be getting a piece of custom furniture for the living room which means that I can’t get it scratched easily. We just can’t buy a ready-made item because the living room has an irregular shape which makes it hard to find something that will fit in it. You love your pets. They are like members of your family. But you probably don’t appreciate what cat or dog fur can do to your upholstered furniture. Fur sticks to the sofa and chairs, collects under tables and even transfers to clothing. And no matter how clean your pets are, your house just doesn’t feel clean with all that fur flying around. But you can keep your furniture fresh with pet furniture covers that will help you to keep the entire house cleaner.